Hello listeners! On this week’s episode of Dragon’s Demize, we’re reviewing the tabletop RPG Awaken. We’ve played Awaken on stream before, and both Greg and Jakub are big fans. In this dark fantasy RPG, players are members of the Vasalli, humans who have “awoken” the latent powers within themselves. These “gifts” give you the incredible ability to manipulate the world around you, but they come at a cost. If used too often, they can corrupt their wielder, rendering you paranoid or worse. Listen to the review for our full thoughts, and then give us a shoutout on Facebook or Twitter with which Order you think you would join if you were a Vasall! 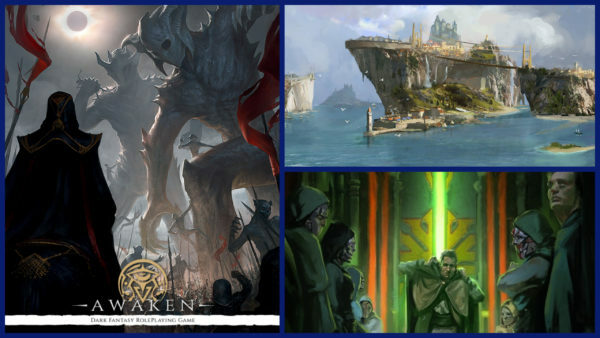 If you enjoyed our review and are interested in learning more about Awaken, you can check out the Kickstarter page for their new sourcebook, “The Liborian Saga”. This book will focus specifically on the Liboria region, but there are opportunities to acquire the Core Rulebook as well! Jakub also gives us a download from his trip to Podcon, and we talk about two new games. Unstable Unicorns is silly, fast-paced card game with an adorable theme, and Wingspan is an awesome new resource-management game from local designer Elizabeth Hargrave. We loved it, so be on the lookout for more Wingspan content in the near future. Thank you as always to O Abnormal and Agata Poniatowski for the artwork and Strangelette for the music. If you enjoyed this episode and would like to support Dragon’s Demize, please consider joining us on Patreon. You can also join us on Discord or what we’re playing on Instagram. Finally, all of our streams, vlogs, and other video content on live on our Youtube channel, or you can catch us live every Wednesday on Twitch.